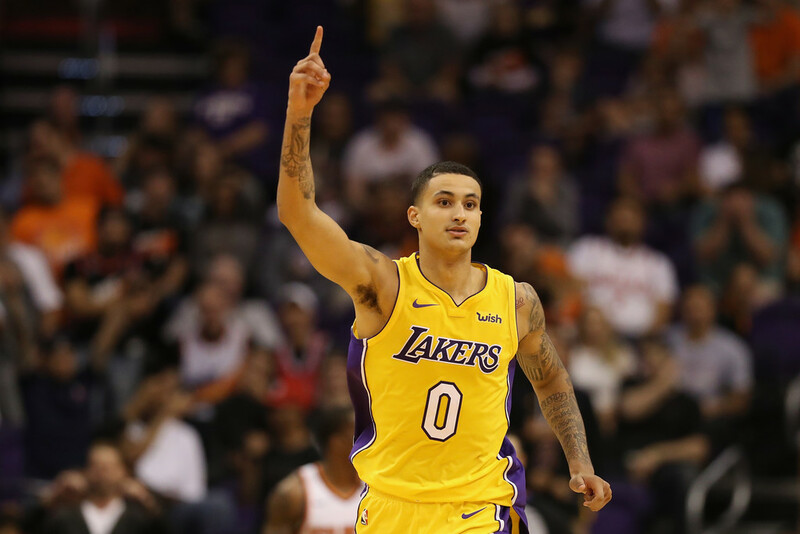 Kyle Kuzma was drafted with the 27th overall pick by the Los Angeles Lakers this year. However, before he went to Hollywood, he was just a simple kid from Flint. While all the hype surrounding point guard Lonzo Ball will dominate the headlines for the Los Angeles Lakers this year, there’s another rookie on the roster you need to pay attention to as well. 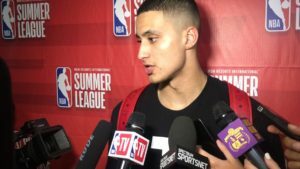 That would be small forward Kyle Kuzma, who had a stellar Summer League play and just recorded his first career double-double in the NBA with 15 points and 10 rebounds in a loss to the Toronto Raptors. But before he became this up-and-coming star swingman that captivated fans with his moves on the basketball court, I knew him as Kyle, well “K-Squared” as I called him — a simple kid from Flint, Michigan. It all started with a tweet I sent to Kyle in 2014 while he was a redshirt freshman at the University of Utah. 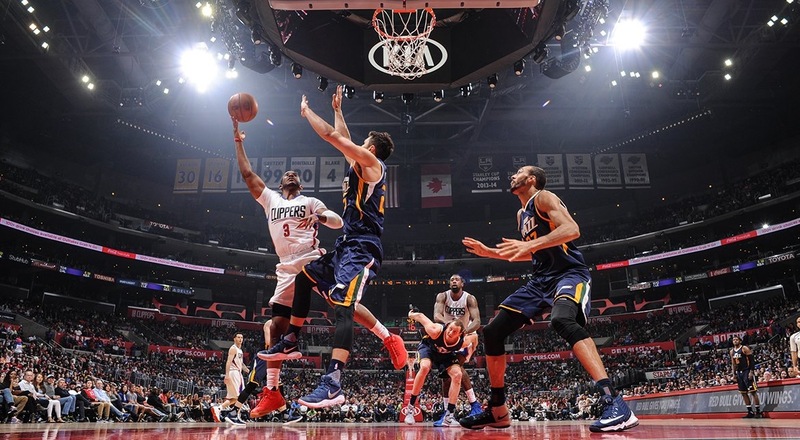 At the time, Utah Jazz beat writer, Tony Jones, was covering Kuzma and introduced me to Kyle as a young journalist. From there, Kuzma and I would follow each other on Twitter and a friendship was formed. Kyle wasn’t flashy at all and kept a very low-profile while he was in college. You would never know he was this big-time athlete by the way he talked and acted around others. At 18, Kyle knew how to cook because he lived far away from his family, who were back in Michigan. He said being independent taught him how to be more mature and manage his money efficiently. It was clear Kyle was an “old-soul” so to speak. He didn’t care about the fame or stats. 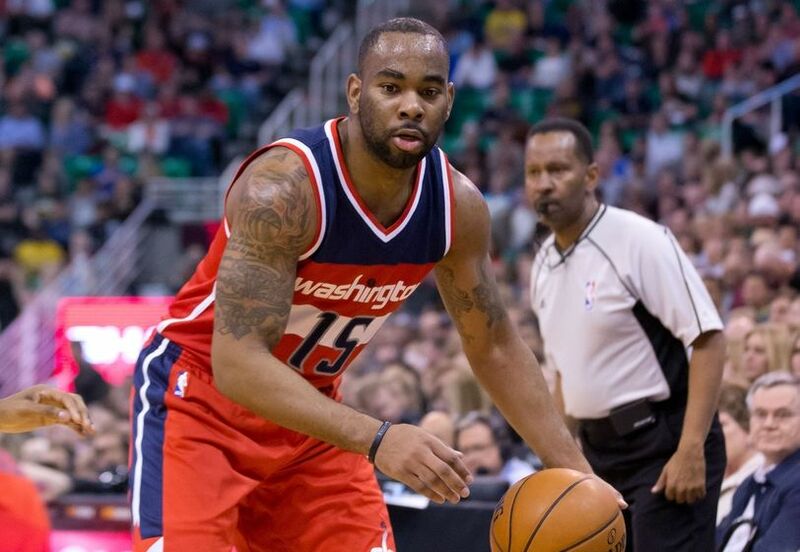 He wanted to win as many games as possible at Utah and build himself into a solid player along the way. After Utah’s season ended and offseason training started, Kyle and I finally met for the first time at a Buffalo Wild Wings in his hometown. Before dining in high-end restaurants as he does now, Kuzma’s favorite place was Buffalo Wild Wings. I can still recall how he ate so many chicken wings, that I would joke with him he’s going to add a lot of weight and not be athletic anymore. For me, having Kuzma around was ideal because I learned so much from him. 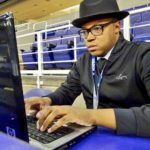 I didn’t understand the relationship between “the media” and basketball players. He always would send me a message whether it was via text, snap, or Twitter to tell me if I sound biased towards certain players. In return, if he tweeted or did something on social media that could be damaging, I’d let him know as well. Kuzma always had my back. I would fly out to Salt Lake City on my own dime to cover certain NBA players and his house was essentially my house. I recall a time when I flew from Los Angeles to Salt Lake City and forgot my winter coat back in Chicago. Kuzma, who picked me up from the local light-rail station by his school, saw me shivering on the train platform in the brutal sub-zero temperatures and graciously offered me his peacoat. Before he would go to class, Kyle would make sure I was good and told me where all his delicious snacks were in his room. I’d send pictures of me wearing his Utah Letterman jacket to his mom and joke that it was my coat now. His mom and I would pretend to argue who was going to have his jacket. 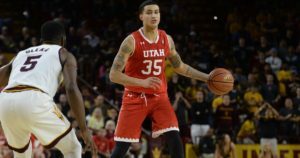 I’d follow Kuzma around Utah’s campus and even met a few of his teammates. 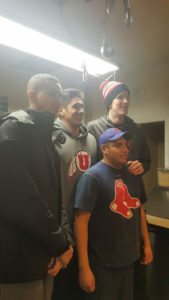 Kuzma and I joined Jakob Poeltl for breakfast and ate at The Park Cafe one time. They took pictures with the staff and signed autographs for the other customers. One day, Kuzma had an interview with a local television station about the Flint water crisis. I informed him how he should answer certain questions to get his point across in a proper manner. Crazy enough, Kuzma taught me how to become a better journalist. I would write stories about him and other players and he would help me edit the stories to ensure they were being told correctly. Anytime I had a problem, I could always talk to Kyle and he always knew the right things to say. His friendship was the most valuable thing to me. However, things would begin to change drastically as Kuzma’s high profile continued to grow. During his last season at Utah, I wanted to see Kuzma in his element and play on his home floor. I didn’t envision it being an issue since he had been so open to me coming to his games in the past. However, Kuzma’s inner circle was growing by the day and he didn’t have a spot for me at his house anymore. Because I was still a student and couldn’t afford a hotel, I was unable to make the trip to Utah. 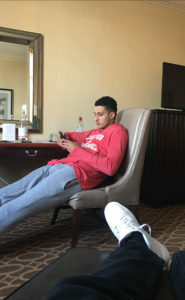 Nevertheless, when the Wizards were playing in Atlanta during the first-round of the 2017 playoffs, Kuzma had a pre-draft workout with the Hawks. I met him at his hotel and we talked and caught up for lost time, and I told him how happy I was for him. I saw first hand all the hard work Kuzma put in just to get to this point and knew big things were coming his way. I still recall while he was in Utah, I’d joke with him that he would become really famous and have his own website, with me as the editor. He always laughed at the idea because he never saw himself reaching that level of fame. 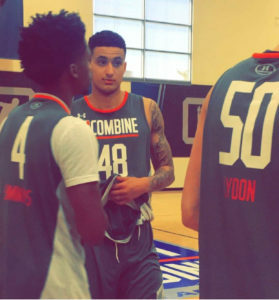 After Game 5 of the Wizards-Celtics series in Boston, I flew to Chicago to attend the NBA Combine where Kuzma was at. Once I arrived at the combine, Kuzma and I greeted each other and I took some pictures of him to share with his mom — who is like a second mother to me. Kyle and I used to talk about how epic it would be for me to interview him at an NBA event so we could finally say, ‘Hey, we made it.’ A dream that we both thought was unattainable had finally been reached. My original plan was to get an exclusive with Kuzma at the combine. Unfortunately, that never transpired, as he was being pulled in many different directions — interviewing with teams, meeting Nike reps and doing workouts. Before I knew it, the NBA Draft was upon us. It had been about a month since I talked to Kuzma. His mother told me about his draft party and how excited she was about it. She believed deeply in her heart that her son was going to be drafted by the Lakers. I tried to convince her to go to the mall and buy some LA gear, but she was so caught up in planning the party, that she didn’t have any time. I wanted to attend, however, I was in Memphis and didn’t want to impose. Kuzma’s mom sent me pictures and videos of how everything was going as I sat in Memphis watching. His mother’s intuition was right because Kuzma was headed to the City of Angels. I wanted to congratulate Kyle on being drafted by such a historic franchise such as the Lakers, but I didn’t want to interfere with his busy schedule. A few weeks would go by and NBA Summer League began. 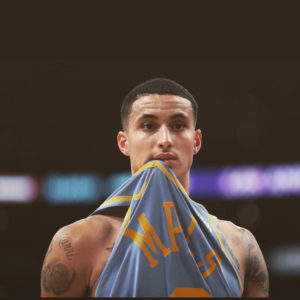 As Kuzma was making a name for himself and people started to recognize his raw talents, I was there live and wasn’t surprised at all from what I was seeing. Tears of joy streamed down my face as I watched my brother live out his dreams. I’ll be forever grateful for Kyle’s guidance and friendship. I’m happy that his platform will allow him to reach millions. I think about the kids back in Flint who have a true role model to look up to. However, I’d be lying if I said I didn’t wish I could turn back the clock and enjoy the good old days of when Kyle and I would video chat and he helped me pick out a new outfit on Macy’s website to wear to NBA games I worked. Whether you know him as “Kuzzy”, “Kuz Control”, “Kuzmamba”, or “Kuzmania”, Kuzma is part of the young core the Lakers plan to build around. You know him as a great basketball player and I will always remember his kindness as a person when he gave me his only dress up coat. Sometimes God puts people in your life for a reason. Everyone you meet in your life plays some role whether it be large or small. I would like to think that meeting Kyle played a big part in my growing process as a student, journalist and man. I have learned a lot from our friendship. What to do and what not to do, and how to keep it professional. I would also like to think I had a part in helping him grow with how to deal with the media, which it seems nowadays, he is just as much a professional at that as he is at playing basketball. Kyle Kuzma is one of the most humble guys I know, and as long as he stays true to who he is, he will have a long career with the Lakers. 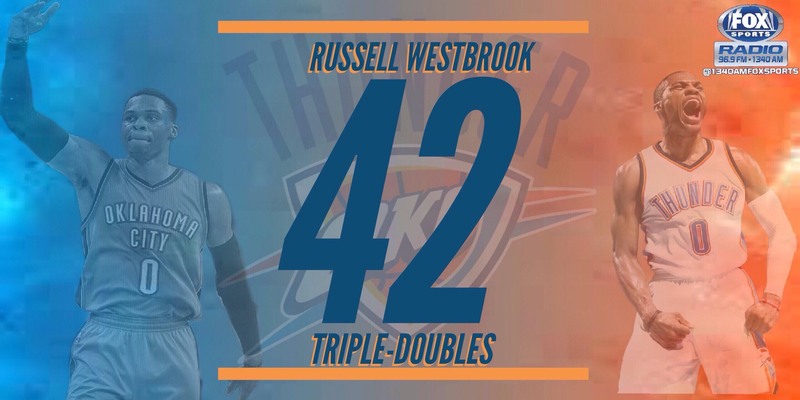 By the sound of the chants coming from the Staples Center for “Kuuuzzzzzz”….I think it’s safe to say that he is well on his way and has already won the hearts of the Lakers fans! Little do they know it won’t just be because of how he plays basketball, but more because of the kind of person he is.